One week after an NBC 5 investigation revealed hundreds of school bus drivers at Dallas County Schools ran red lights, and the district used taxpayer money to pay the tickets state Senator Don Huffines says enough is enough. Huffines wants the state legislature to shut down DCS, the district that buses students at Dallas ISD and other local schools. Huffines has long been a critic of DCS. But after seeing the NBC 5 reports showing bus drivers were not punished for more than 480 cases of dangerous driving, Huffines said he is more convinced that the district has lost sight of its core mission, getting kids to school safely. State Senator Don Huffines wants the state legislature to shut down Dallas County Schools, the transportation service that buses students at Dallas ISD and other local schools. On Nov. 18 Huffines appeared on Lone Star Politics and said he would file legislation in January to shut down DCS. “Paying $80,000 of fines for their drivers, not reporting any of it, not having any disciplinary actions on their drivers shows they're not too concerned about safety,” Huffines said. After NBC 5 started asking questions about the red light tickets Dallas County Schools fired 13 drivers, suspended 229 more and demoted two high level managers. Dallas County Schools took the information from [NBC 5] and we acted swiftly and decisively," said DCS board President Larry Duncan. But Huffines believes the situation at DCS is beyond repair. “I don't think there's much being run right at Dallas County Schools, honestly," Huffines said. In January, Huffines said he will urge the legislature to begin phasing out DCS - allowing private bus companies to step in. The republican senator’s concerns have been brewing for months. In August, he pressed DCS at a sometimes contentious senate hearing, questioning why DCS has spent millions of dollars running school bus stop arm camera ticket programs in other counties across the state. The district spent $25 million to essentially become a bus camera dealer for a private business. “And they've gone outside of Dallas County way past anything that would be prudent to implement their transportation to implement their camera technology, doing anything they can to justify their existence," Huffines said. But on Wednesday, Duncan defended the camera program saying the money is well worth it. “The safety of students everywhere in Texas is important and we are improving that," Duncan said. Duncan also argued closing DCS would put an even bigger burden on taxpayers. “If there were private organizations that could be doing it better - cheaper - they'd be doing it," said Duncan. 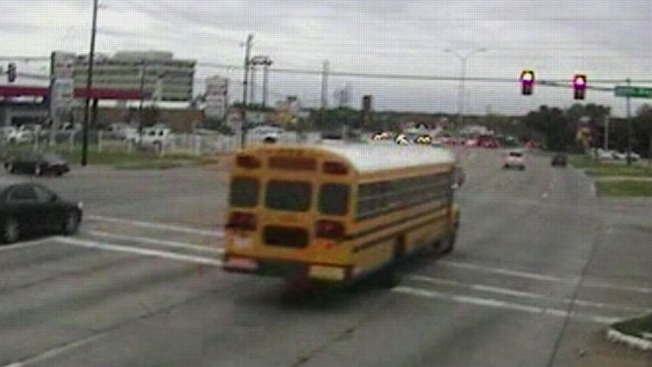 But after NBC 5 Investigates revealed videos and tickets showing more than 480 cases of DCS school buses driving dangerously, and records showing a breakdown in the supervision of bus drivers, Huffines believes time is up. “They've done a great job of justifying their existence over the last few decades and now they're supposed to be providing transportation and they're doing a very bad job of it," Huffines said. It's unclear right now how much support Huffines will have for closing DCS. At the senate hearing last summer, other senators seemed concerned about spending at DCS, while some expressed support. Dallas and Harris counties are the only two in the state that still have these county wide school districts that provide busing and other support services. Dallas County taxpayers pay one-cent on their property tax rate to support DCS.